A tech business that gives back. 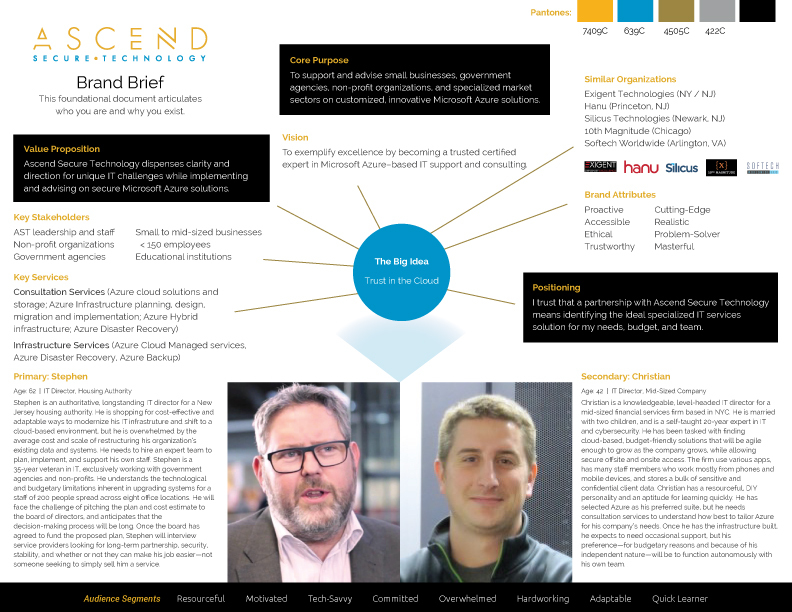 Ascend Secure Technology is an established Microsoft Azure service provider for nonprofits, educational institutions, and small businesses. The company hadn’t ever undergone a formal branding process, and was looking for a renewed brand presence. The owner’s business goals include gaining more credibility in the marketplace while attracting clients within his target industries. His existing brand identity was dated, and his messaging and content lacked focus and organization. Beginning with a series of brand consulting sessions, we helped fine-tune the direction of the brand, its value, and its target audience. We performed extensive competitive analysis to identify industry leaders and help the business owner to understand how to pivot the business around a true brand voice with a modern image. The business owner also asked for help with PR and positioning. 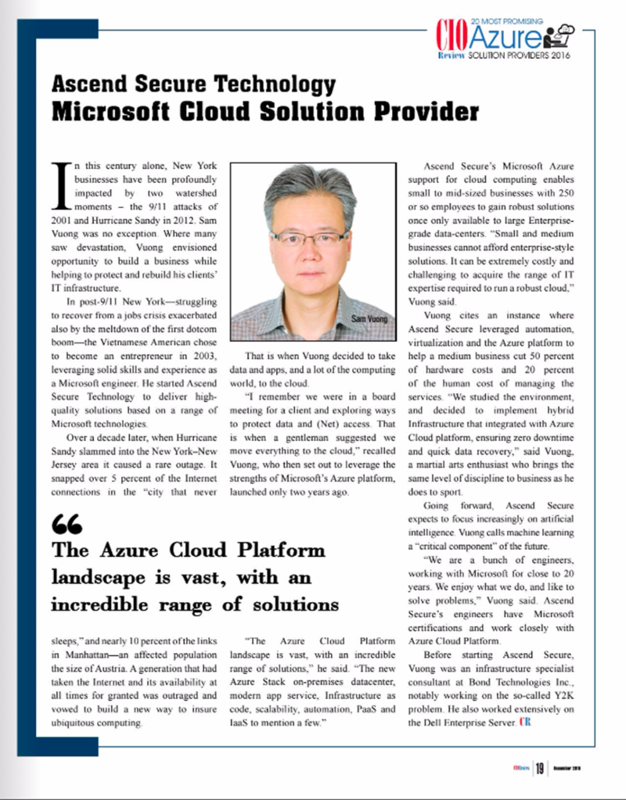 He was being honored by CIO Review magazine as one of the 20 Most Promising Microsoft Azure Service Providers for 2016, a high honor in his industry and great exposure. He was concerned about how best to present himself and answer interview questions. We coached him through mock interviews and helped him prepare, as well as reviewed and marked up the article that was written, in preparation for publication. Humanizing an IT firm with an owner reticent to show any ego was a significant challenge. But emerging from those brand consulting sessions came his personal narrative of having started the firm following 9/11 and helping NYC businesses after Hurricane Sandy. With a mind toward the article appearing online and potential SEO boost, we helped him position the article around a brand story of being a longstanding New York City firm—with heart—specializing in cyber-security and emergency response at a time when those two topics are heavily trending.